Artist Andrea Maack has launched Dual and Soft Tension, two new unisex fragrances. Dual ~ "Dual by Andrea Maack is a unisex sport fragrance inspired by the calming water of the natural hot springs in the Icelandic highlands and its more active existence in the country’s competition swimming pools. This fragrance mimics the feeling of fresh water on the skin and the intense color spectrum surrounding the hot spring lagoons. The powerful, uplifting aromas of ginger, lemon and pink pepper coexists cedar wood resulting in an enlivening scent experience." Soft Tension ~ "Soft Tension by Andrea Maack is a sensual white musk inspired by a thick mysterious fog. Like a white desert, the fog is a place to get lost in and let go. This fragrance is a bold mix of musks combined with freesia that grounds itself in the skin. Black raw materials are mixed with white ones such as mate absolute, cedar wood and moss creating the soft tension." 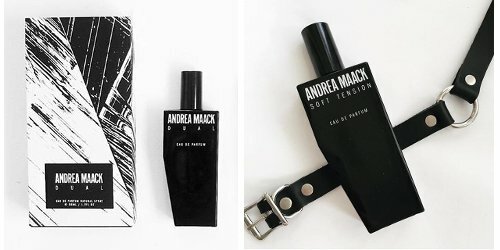 Andrea Maack Dual and Soft Tension are available now at Storm in Denmark, in 50 ml Eau de Parfum. Kind of curious about the idea behind soft tension…though I think the ‘fog’ element is enough ( without a white desert, too…maybe somethings get lost in translation). Good bottle and I hear Coal and Craft were good? hope someone reports back. I really liked Coal. These 2 admittedly do not sound like my thing: hate white musk, and not fond of aquatics.